Register: To speak to Gabriel Kyne about the course ring 0784 1593651. See testimonials. This is a 1 day course designed as an introduction to robotics for children from 9 -14 years. Students build and program three very different robots. 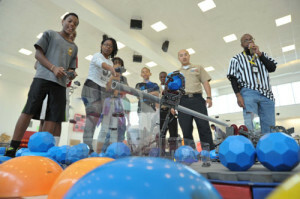 They will complete team challenges such as robot football, fencing and the maze challenge. Program offence and defence robots so that your team can win the football challenge. Building and programming robotic arms is great fun; especially when you have to teach it how to fence with another robot. “Its so much fun and taught me so much about control” Jane Withers- 9 years. The Mindstorm EV3 robots are state of the art robots which can be designed and programmed to complete any task. The challenge will require all your engineering skills, strategy and teamwork to complete. ” The robots are fantastic as you can get them to react in loads of different ways. They have so many sensors and that gave our team a real advantage ” Josh Hatton- 14 years old.